Postsurgery, and a couple of days after the deep brain stimulation procedure. July 21, 2013 | by Darcy Blake | Now that I’m on the other side of DBS and looking back, you may be asking how was it? I think that the worst part for me was the feeling of nausea due to the anesthesia throughout the operation. My scalp was numbed with anesthetic, and then Kaiser used a stereotactic frame, part of which is the “halo” that was placed on my head. Dr. Gary Heit started the DBS program at Kaiser-Redwood City, and he feels the accuracy of the older frame-based method that is used at Kaiser combined with repeat X-rays is worth the extra time in the operating room. This technique is used more in Europe, where minimum OR time is not so critical as it is in the United States. I am thankful that Kaiser focuses on precision, even if it takes longer. Fortunately, I had plenty of hands to hold and the halo was on before I knew it. From around 9:30am until around 11am, I was in the recovery room waiting for the main part of the surgery. This was just long enough for me to go to the bathroom. This turned out to be a long procedure that I might have reconsidered. They had to unloosen me from the IV, wheel me over to the bathroom. I was able to get the job done, but in leaving the bathroom, due to the halo, I did not have my normal peripheral vision, and I bumped my halo into the doorway. Can you imagine?! The very thing I had to be most careful about! That kept me worrying about whether I’d done any irreversible damage throughout my brief visit with my sister and daughter. Before I knew it, it was time to roll back into the surgery room and the surgery was underway. I had a catheter inserted into my bladder and at the beginning of the operation, sedation was given to improve comfort and decrease anxiety. I can’t tell you much about the many hours that it took to do the surgery. I was holding on trying to not get any sicker throughout most of it. “Stay awake,” they kept urging me when it was the last thing I wanted to do. Dr. Eric Sabelman performed micro-electrode mapping of the target nucleus to determine the exact target for the DBS lead. This helps make the surgery precise and improves the surgical outcome. The lead is inserted through a small opening in the skull called a burr hole. The pins holding the halo on my head were used as markers when Dr. Eric Sabelman analyzed the X-rays that were taken during surgery. During surgery, I was asked questions and was asked to perform some tasks, such as counting or moving my toes or fingers. This helps the physician test the stimulation and maximize symptom control, while minimizing side effects. I vaguely remember doing some “follow the finger exercises” and “look into my eye so I can check your eyeballs,” exercises, but beyond that I was just trying to keep my nausea in check. The neurostimulator was placed when I was under general anesthesia. During the procedure, a small incision is made near the collarbone, and the neurostimulator is implanted under the skin. It is connected to the deep brain stimulator lead by an extension, which is passed under the skin of the scalp, neck and shoulder. In post-recovery, I remember my sister and daughter coming in for a few minutes, and then I was out. The next few days have been kind of a blur of sleep, meals, and taking meds. I have taken Percocet pretty much on schedule since the surgery. Today, however, I lengthen my time between doses, and tomorrow should even be better. That means that I needed the pain-killer full-time for three days after surgery. The most uncomfortable part continues to be the neck pain. I think that the introduction of new tubes in the neck are something that takes a while to get used to. Of course, the tremor has yet to be tested. I will be home for two weeks prior to turning on the juice that will stop the tremor. Sometimes, patients get a bit of relief — called a micro-thalamotomy effect, or a micro-lesioning effect—right after the surgery because there is an after-effect from the meds and the lesion that occurs during surgery. This effect is related to swelling around the stimulator wire after surgery. This produces temporary relief of our symptoms and may cause a sense of euphoria. My sister says that she noticed that there was some short-lived relief from the tremor right after surgery. If there was, I was not coherent enough to notice it until it had passed. I am not going to dwell on my lack of good fortune not to have tremor relief instantly, but instead, focus on getting stronger because my time to see the results will be soon enough. That’s my progress report and I will update as time goes on. I couldn’t end this without thanking the team at Kaiser Permanente for the incredible extra-special care they gave me while I was there. I couldn’t have dreamed of it being any more attentive than it was. From neurosurgeon Dr. Mark Sedrak, to the functional nuerosurgery/pain management team of Ivan Bernstein, and Diana Bruce, the bioengineer Dr. Eric Sabelman, and all of the nurses and skilled workers there, it was an enormous first class effort for which I will be eternally grateful. Thank you for sharing your experience. Positive thoughts for a quick and effective recovery! Thanks for sharing – brave woman!! Darcy – amazing experience = good luck with your recovery. Darcy- you are brave and strong! 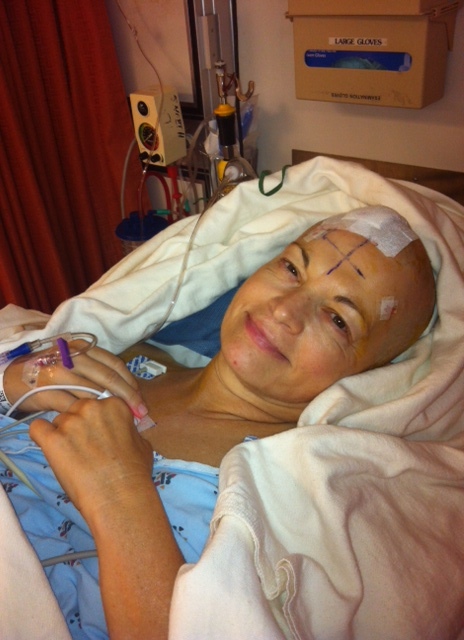 I want my aunt in Modesto to meet you after your recovery– she is going through the same thing. I think you are ready to come back to work! This is the problem with allowing one’s boss to read their blog. Yes sir, Mr. President. I will do my best.